Take the red pill and you'll get to stay in 'Wonderland' but you'll be shown the truth, the reality of what your world is. You get to see 'how deep the rabbit hole goes' as Morpheus put it, and it won't be easy to take in. Mitt Romney will prove the Democrats have no idea and will show you the reality of what it takes to run a country by making the hard decisions... like giving big bird a pay cut. When you look at it like that you might think the red pill is the best option. Truth is better than ignorance right? But I'm pretty sure you'll be just like Cypher from the Matrix. 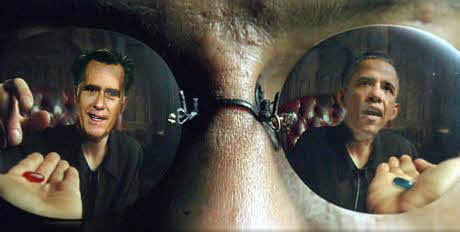 If Mitt wins, a year or so in, you too will be asking yourself "Why oh why didn't I take the blue pill?" Well I did say my analogy falls apart... if you're a Democrat supporter at least. Republicans might read this and think it's right on the money... because money is what it's all about... and big, strong armies too.